Buy Gamma Grow from All Veterinary Supply for less! Gamma Grow is a safe, non-toxic, natural steroid alternative that may help enhance body conformation and develop lean muscle mass. Gamma oryzanol is commercially extracted from rice bran oil as ferrulic acid and other associated compounds and is commonly used in Japan in the preparation of foods and beverages. Chemically, gamma oryzanol is a highly effective membrane antioxidant that appears to act as a "scavenger" of free radicals produced during anaerobic exercise. Further benefits include the potential effect on digestion and stomach ulceration and gastritis. Available without a prescription. Who is Gamma Grow for? How is Gamma Grow used? 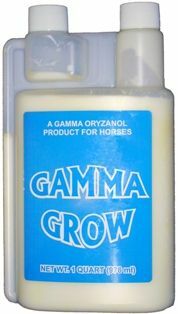 Trust Gamma Grow to enhance your horse’s digestive system, promoting comfortable digestion while treating gastritis, ulceration and other gastric conditions. In addition to gamma orzanol, Gamma Grow contains creatine monohydrate to increase energy. Give your sluggish ponies a bit of extra energy. Purchase our 32-ounce easy-dose bottle. Squeeze to pre-dose your Gamma Grow or pour directly from the main spout. This product works overtime to increase your equine’s health. 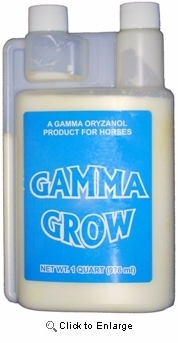 See the difference in your horse’s energy levels, digestion and muscle development by adding Gamma Grow to its diet. How much Gamma Grow will I receive? Directions for Use: Use 15 ml per day up to 1,000 lb (454 kg) of body weight. An additional 15 ml per day may be used for larger horse breeds and camels.